Just give your body freedom from those two health destroyers and watch your health soar. We live in a toxic world. In the past 100 years we have changed from a world where most people died at a young age from bacterial infections to a world where must people suffer poor health before dying at a much older age. The reason is that we eat, breath, drink and rub ourselves with toxins. In fact, for some people just spitting in the toilet bowl could be a violation of EPA rules governing disposal of waste water. That’s because are bodies have accumulated more than 150 pesticides and heavy metals. On top of that, we are overloaded with microorganisms such as fungus, parasites, virus and mycoplasmas. These toxic and disruptive elements in our bodies overload our body’s systems for removal of toxins with the result that we become sicker simply by living longer. On top of that we eat sugar by the tons (during a lifetime) and the sugar deals serious health blows to us by degrees. We are essentially a world that is poisoned by degrees. The bottom line is that a large portion of our health efforts needs to be focused on becoming and staying clean internally and dealing with the consequence of toxins. More antioxidants to combat toxic free radicals than you can get in any other way. Protective bacteria to fight the harmful microorganisms that will take over the body otherwise. 28 times strength Aloe to specifically assist in control fungal populations in the body. What is so special about the Stay Young Health Kit? First, of all, in the way of background, it was designed by an expert in the arena of what really works restoring and maintaining health, namely, Dr. William R. Kellas. Besides holding several advanced degrees, including nutritional biochemistry and naturopathy, Dr. Kellas has participated for 20 years in the treatment of some of the most disease-challenged people on the earth. Twenty years ago, he co-founded the left for Advanced Medicine in Encinitas California. He is a weekly radio talk show co-host of a celebrated forum on health called, “Health Talk - A Second Opinion”. He has written three books of overcoming the challenges of toxicity in our modern world and is sought-after lecturer on the subjects of health and human nature. With Dr. Kellas’s deep understanding of the needs of ill people and the the course that people must traverse in regaining and in preserving their health, Dr. Kellas’s expertise is invaluable. The products in the Stay Young Health Kit were carefully designed by Dr. Kellas. In most cases, what he designed out of these products is as important as what he designed in. For instance, vitamins aren’t part of the Stay Young Health Kit. The U.S. consumes more vitamins than the rest of the world combined, yet has among the poorest statistics for quality of health in terms of number of years lived in poor health and actual longevity. Instead of vitamins, the Stay Young Health Kit includes Seven Essentials, which is a concentrated food product. Once a day, put a capful of the Aloe Vera Power concentrate in your mouth, and gargle and swish it around for fifteen seconds so it touches every part of your mouth. Then swallow. Mix and drink your Seven Essentials at the same time each day, so your body know when it can count on a boost of nutrition. You can get creative with your own recipes. Once a day, take three capsules of Kona Minerals with a glass of water. With each meal, take a capsule of Cleansing Enzymes. Using the Health Success Kit as part of your routine nutrition is one of the very BEST ways to ensure that you stay young. Unfortunately, because the ingredients of the Stay Young Health Kit aren’t exotic most people look at other, more costly, more ‘interesting’ products. This is called looking beyond the mark. We suggest you look right here. Success in any endeavor doesn’t come from what you do on occasion, but rather it comes from that which you do daily. The Stay Young Health Kit is your daily do, for those who want to be as healthy as possible for as long as possible. The Stay Young Health Kit DIRECTLY OPPOSES the two factors that undermine health, which are toxicities and deficiencies. In combination with doing the Eight Day Cleanse, once or twice a year, the Stay Young Health Kit, is the foundation on which to build long-lasting health. The most prevalent toxicity Americans face is excess sugar and carbohydrates in the diet. The Stay Young Health Kit will assist greatly in this regard by killing the desire for sweets through a daily dose of our 28 times strength Aloe. The Stay Young Health Kit also helps to maintain protective bacteria in the intestines, by providing two different species of protective bacteria (lactobacillus sporagenes and lactobacillus salivarius) that will implant in the intestines, and oppose the harmful bacteria that are constantly trying to get a foot hold. The Stay Young Health Kit furnishes enzymes to keep your digestion clean and liver boosting ingredients to keep your liver detoxification powers on high. 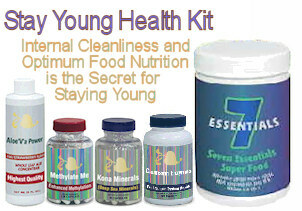 The Stay Young Health Kit furnishes your body with a comprehension of nutrients to overcome deficiencies in the form of Seven Essentials and Kona Minerals that you just won’t get in any other way. Finally, the Stay Young Health Kit furnishes your body with methyl donors and methylation catalysts so that the methylation process of repairing your body’s molecules stays in high gear. for year-round use. It is specifically designed to give you maximum health supporting advantages all-year round. The Stay Young Health Kit contains five products. We recommend to you that the Stay Young Health Kit is perfect for a monthly auto ship order. Nourish the cells of the body — with foundational, comprehensive and easily digested foods and minerals. Build the body’s mineral reserves — which will also normalize the pH. Minimize populations of harmful microorganisms and parasites — by killing these health robbing invaders and by fostering the growth of beneficial bacteria in the intestines. Minimize cravings for sugar — by killing fungus in the mouth - and by helping to normalize blood sugar. Improve digestion of foods — so that toxic, incompletely digested foods don’t result. Implant beneficial bacteria in the intestines — which will fight against harmful microorganisms. Most People Are Deficient in Real Nutrients. Modern diets do not lack fuel, i.e. calories and carbohydrates (we get plenty of those in the form of bread, pasta, pizza, fruits, etc.). What is missing from most modern diets are useable nutrients such as plant nutrients, minerals, amino acids and essential oils. Likewise, most of our diets furnish insufficient amounts of antioxidants with which to fight the free radicals that continuously attack the molecules of our body. The Stay Young Health Kit actually feeds the body with the equivalent antioxidants and nutrition of more than 42 servings of vegetables each day. It is a nutrient, trace-mineral and antioxidant bonanza! A serious dietary problem of modern people is the excessive amount of sugar and carbohydrates they eat. Sugar and carbohydrates feed fungus growth and interfere with the body’s mechanisms for controlling fat storage. Overconsumption of these is especially to disruptive to leptin communication, resulting in the body becoming unable to burn fat for fuel, resulting in the constant deposition of new fat and the cannibalization of bone and muscle for sugar energy. This translates to an inability to normalize one’s weight, constant overproduction of free radicals and acceleration of the disease process. It provides less than 100 calories per day. Its intense nutrition satisfies the body. This means you won’t feel a need to constantly snack. It helps curb the desire to eat sweets by killing oral fungus. Another serious problem of modern people is poor digestion, which results in toxic buildup. After the age of about 30, our bodies produce fewer enzymes with which to digest the food we eat. Consequently, our food does not digest completely and some of the food we eat turns into toxins that are stored by the body in joints or fat, or as water storage beneath the skin. This contributes to autoimmune disorders and to being overweight. It creates sluggish, polluted bodies that just can’t function optimally. The Stay Young Health Kit furnishes enzymes that help to make sure that the foods one eats are cleanly digested. The Stay Young Health Kit also furnishes digestive bitters that stimulate production of gastric juices that help digest food and help kill pathogenic bacteria. Most people have the wrong proportion of protective bacteria versus harmful bacteria in their alimentary/gastro-intestinal system. People’s gastrointestinal systems should be populated 80% by protective or beneficial bacteria, allowing only 20% of the microorganisms in the body to be in the harmful group. Unfortunately, in many people the ratios are reversed with 80% harmful bacteria. The result is that the body is overloaded with the toxins produced by harmful bacteria. The Stay Young Health Kit helps maintain a healthy ratio of beneficial versus harmful bacteria. Seven Essentials furnishes the most prolific form of protective bacteria known as lactobacillus salavarius. Cleansing Enzymes furnishes a type of beneficial bacteria known as lactobacillus sporagenes that is encapsulated in spores. This helps it implant in the colon. The Stay Young Health Kit includes a 28 times strength Aloe Vera liquid concentrate (Aloe 7000) that is very helpful at killing fungi, bacteria and viruses in the mouth and stomach. It is also helpful at repairing tissues that have been damaged by microorganisms. Most people’s livers are dealing with far too many toxins. As noted above, the number of toxins and stresses that the modern human body deals often exceeds the capacity of our body and especially the liver, which is the master detoxifer of the body. The Stay Young Health Kit includes liver strengthening botanicals that are just shy of miraculous in boosting the liver’s capacity to deal with stress.